This issue’s article (at the end of the newsletter) is from Nathan Annenberg, a retired math coach in the U.S.A. It is titled: ‘An Analysis of My Workshop at a New York State Math Teachers’ Conference’. There has been an ongoing groundswell of interest in, and development of, the Vedic Mathematics based on the sutras propounded by Shankaracarya Sri Bharati Krishna Tirtha. 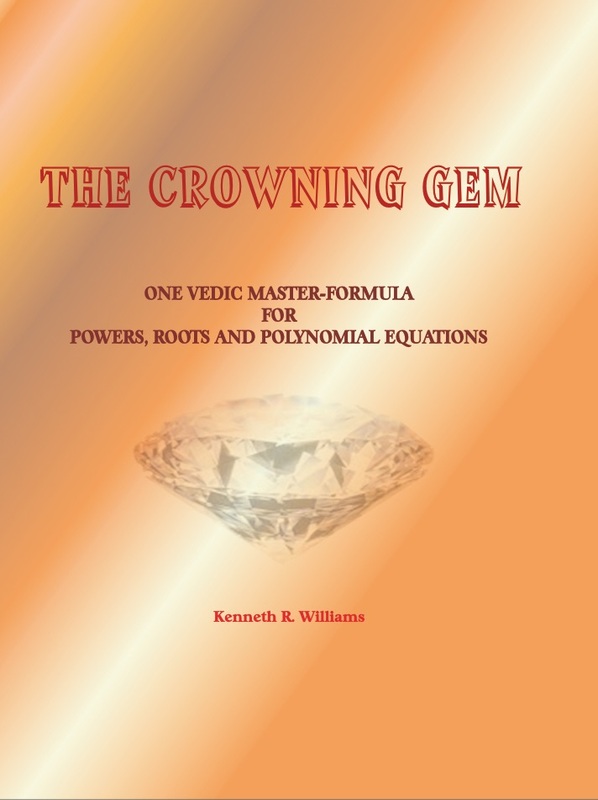 This Vedic Maths is profound, unifying, flexible, fast and fun. Educators across India and other countries are seeking to find how the system can be integrated into the curriculum. A special session is planned for the Vedic Maths practitioners under “Global Projects” to share their initiatives, their success stories, future-plans, challenges etc. There will be hands-on workshops for teachers, children and parents to enable them to see the profundity of this wonderful approach to solving maths problems. Please visit - http://instituteavm.wixsite.com/ivm2016 to register and to know more about our distinguished speakers. If you have been asked to send money for the above conference to Gaurav Tekriwal or his organisation you are advised not to do so. He is not involved with the conference in any way. By Pietro Nolasco and titled “Multiplying numbers nearing multiples of different bases”. And by Rohan Chandra on “Cube Roots”. 4 + 44 + 444 + 4444 + 44444 + 444444 = ? 2) multiply 1 ) by the digit that is the same. I am dividing this presentation into two segments. The first is the workshop itself. And the second is something I have not done before – some tips I gained from experience on how to prepare for a presentation using the available technology. Without this latter aspect, my workshop would not have succeeded. The math organization sponsoring these workshops is called AMTNYS. Association of Math Teachers of New York State. Several months ago I reported to VM magazine on an earlier workshop I gave on VM for this same organization. There is also a national organization called NCTM – National Council of Teachers of Mathematics. Alas, they were so flooded with proposals by speakers, they had to decline many of them, including my own. Rather than see this as a defeat, it’s just one more challenge to overcome for next year. Nevertheless, I did attend their Eastern regional in Philadelphia, not just to learn new math tips, but to network (and hopefully spread VM nationally), and also to observe how they used their technology. It looks like the era of the document camera has truly arrived. More on this later. “Out-of-the-Box Methods For Mastering Math”, one of the products on my website. My goal was to parallel my online course “Lighting Fast Algorithms for the Four Operations”. For each operation I present transitional pre-Vedic methods I either invented outright or at least adopted from other sources and gave a twist of my own. VM is always the pinnacle method at the end of each section. The only exception to that was my opening, because I wanted the teachers to be startled right away with the power of VM.  I commenced with a proven motivator: multiplying near a base. I heard the usual stunned “I can’t believe this!” and similar evaluations within the first five minutes. I covered deficiencies, then excesses, starting at base 100, then base 1000. I then stressed the importance of extending the generality with ratio and proportion. Ex. 98 X 47: double the 47 to 94 to force a near base situation, get the VM answer, then divide by 2 to account for the original 47. I used a special form of short division for one digit that is much more concise than the clumsier vertical long division. I deliberately held off on excess factor X deficient factor till later. a. Adding by showing all the carries but not solving till the very end. They had to get used to blending a carry to its partner on the left. b. Written running totals, i.e. gradually building the final sum from partial sums, while blending yet a new carry leftward, if needed. c. VM addition – Doing the running totals mentally. b. left-to-right running totals using negatives when present, but as expanded notation. Ex. 456 – 188. Think 400-100 = 300, then 50-80 = -30, so at his point it’s 300 - 30 = 270, then 6 – 8 = -2 so you end with 270 – 2 = 268.
c. the classic Vedic bar number subtraction. They experienced how methods a and b were quite effective up to about 4-digit numbers, but starting with 5 digits, the VM method was so much faster and elegant.  I gave the class a break of about 20 minutes with math puzzles and riddles. They needed time to decompress. I am well aware of a learning psychology phenomenon called “pre-active inhibition”. It means your brain is so worked out learning challenging previous material, it is not optimally ready for further material, at least not until there is some sub-conscious processing of what has been learned so far. To be truthful, a few teachers were struggling with visually retaining the partial sums of the long (5 digit+) VM addition problems. I had anticipated this, and emphasized they would need diligent practice, but when they passed through that crucible, they would be unbeatable with their VM skills. However, to repeat, I wanted to give them this break, and the riddles were indeed fun and rigorous.  We returned to multiplication near a base, but now mixed excess with deficient factors. By now they had bar number experience, especially with my impressing on them previously “all from 9 and the last from 10”. They could now get that negative vertical product. I then ratched it up a notch by bringing back the ratio applications. Ex. 306 X 95 i.e. Divide the 306 by 3 for 102 X 95, solve with VM and bar number vertical product, then multiply that answer by 3 to get back.  The audience surprised me in that they were all middle school and high school teachers. I did advertise some upper grade math topics, but they knew it was mostly basic arithmetic operations. The fact that they attended reveals to me that so many teen-age students still needed stronger arithmetic number sense. However, to satisfy their eagerness to learn subjects more at their grade level, I switched now to higher grade subjects.  VM does not usually deal with statistics. For the middle school teachers in the class, I introduced two algorithms I developed for this subject. b. finding the median of an even numbered ordered list mentally in 5 seconds without needing to add the bracketing numbers around the middle and dividing by 2.  Finally – a big favorite of mine. The VM way to get a linear equation from two points. The class gobbled this one up. My time was up. I couldn’t touch VM multiplication – general case, or VM flag division. However, I teased their interest by solving a typical 2-digit divisor flag division problem. I deliberately kept the ones digit of the divisor very low (it was a 1 or 2) because there was no time left and I didn’t want to get into negative partial differences. As I said earlier, it was probably just as well, because they had worked so hard that pre-active inhibition would have slowed their learning up. There is also “post-active inhibition” where subsequent challenging learning can interfere with your absorbing and processing of previous learning. I got a gratifying round of applause at the end. Unlike other presenters, I did not just talk at my audience and give them fancy PowerPoint presentations. I had them actively working and involved through the entire 2 ¼ hours. You learn much better that way. Of course, some other presenters also had their students working things out, but based on my attending several AMTNYS sessions, I think mine was by far the most involving of students’ participation. One more thing – be prepared for excited teachers to ask you for derivations of the VM methods. This happened to me. I asked Ken Williams for help and he came through. I was able to contact the inquisitive teacher with the email she gave me. But it might help to know many of them in advance.  Show up the day previous to your presentation (or much earlier the same day) and do a full “dress rehearsal” of using the technology. It is a good thing I did just that. I could not get the projector to work. Fortunately – these hotels and convention centers have tech experts who are ready just for events like that. A bright young man came in and hit a switch on the projector which had a list of options. He got to the correct one. (Apparently there is one option for showing slides, and another for showing computer-generated images. My option was simply showing documents.) Later that day, I rehearsed again, and this time the laptop was not picking up the image under the doc camera. The tech guy tried a few things then suddenly said to turn everything off and restart. It succeeded. The next day was my presentation and everything worked perfectly. 90% of my workshop’s success was preparation – both mathematic and technical. The actual presentation was enjoyable because I didn’t have the anxiety of malfunctioning equipment hanging over my head. Hopefully – my words, both from part 1 and part 2, can help some other presenter in similar circumstances.